If I tried to carry every tool I wanted on my bike, I'd have to add a couple of extra wheels and call it a car. I have a tendency to overpack, especially when it comes to the functional things. When I camp, I usually find myself with lots of extra rope and not enough clothes, but I digress. Tools are an absolute necessity if you don't want to walk away from an injured machine on the side of the road. When I was a kid, my father was driving and we passed an old late 60's Harley left on its lonesome. My father lamented his morality and the fact that we weren't in a pick up truck. I'm not saying that your bike will be lifted if you break down and are ill-equipped to handle it. I'm just saying that you leave it vulnerable. 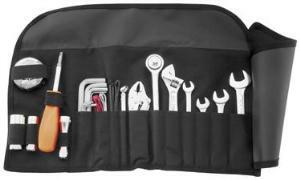 This BikeMaster tool kit comes with bunch of basic wrenches, an adjustable wrench, a ratchet wrench, pliers, a tire gauge, cable ties, electrical tape and wire, a hex set, a flashlight, etc. etc. etc. All of this comes in a handy roll bag. This ought to be everything you need for a quick roadside repair. Nothing in this world can protect you from the possibility that an irreparable problem might come up, but a portable tool kit is not just about making repairs. A portable tool kit is about keeping your bike in good repair and avoiding those bigger problems. If you don't already have a kit, buy one or make one. Buying is probably cheaper. Don't see the tools you want? CruzTools' tool bag kit might have what you're looking for.